The sacred Birman originated from France, and it is the only cat that wears gloves all the time regardless of the weather outside. Be it winter or summer; the Birman never removes its gloves. The main reason for that is because they are born with the gloves intact, and they can’t be removed. The Birman cat remains to be a fascinating cat since everything about it is unique. It was first recognized in France in 1925, and there is only a myth to support its history. Apparently, Birmans lived in a temple, and they were devoted to the temple priests. A blue-eyed goddess was impressed with the cat’s loyalty to the priests, and she decided to reward the cats by giving them a lovely white coat resembling the priest’s cloth and transformed their eyes from yellow to blue color. The cat’s paws were made to have a distinct white color to signify purity, and that is why the paws are said to resemble white gloves. During the world war two, most of the Birman cats died and miraculously only two were found alive in Europe. If it were not for the last two cats, the Birman breed would be extinct. 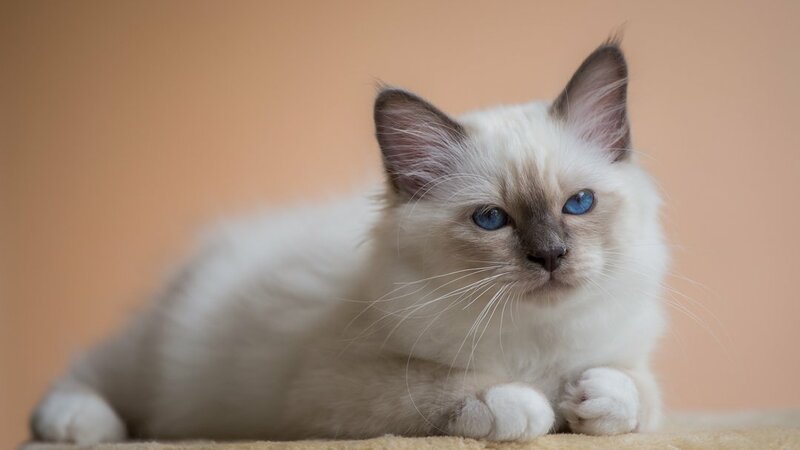 A lot of cross-breeding was done with other cats like Siamese and the Persian and after a while pure strains of Birman were obtained which helped promoted the Birman lifeline. This cat has a lifespan of 15 years. The Birman is one lovely cat to look at. It’s a very simple cat but with several distinct features. The snow-white gloves cannot be forgotten; neither can the blue sapphire eyes, the silky white coat, and the unique color points that develop several weeks after birth. The color points are majorly on the cat’s limbs (not the paws), ears, some parts of the face and the ears. They are easily noticed on a seven-month-old Birman compared to newborn kittens. The head is broad and rounded despite initially being cross-bred with Siamese cats that have a triangular shaped head. The Birman is a fun and gentle cat at the same time. It is easy to play with it as long as you are not rough with it. Its active nature makes it an excellent outdoor cat while the gentle nature makes it a unique indoor cat. Therefore, it can quickly adapt to both environments. The Birman loves human company, and it is a friendly cat which does not have a problem warming up to people. It craves attention which causes it to follow its owners everywhere. It loves the company of kids too, and you can trust it to play with them safely. In addition to being friendly, the Birman is known to be comfortable around cat-friendly dogs after a thorough introduction to them. It is not rare to have a Birman and a dog living together in the same house. Like most cats, the Birman is also brilliant, and the good thing about it is that it does not use its intelligence to blackmail its owners. It is a quiet cat and rarely does it fuss over something. It’s the kind of cat that will not whine in the middle of the night for you to open the door and let it in. Once it is trained on how to use the cat flaps, it is good to go. Its intelligence helps it to be independent though it will follow you around at times just to remind you that it still exists. Birman cats are pleasant cats to keep, and the best part is they require moderate grooming to keep their silky coat in good shape. Regular shedding is expected, but good nutrition will help keep the shedding in check.